It'd been a long time since my last visit to The Grove, which was in 2012 to check out the short-lived Fat Cow (at the site of the current Blue Ribbon). 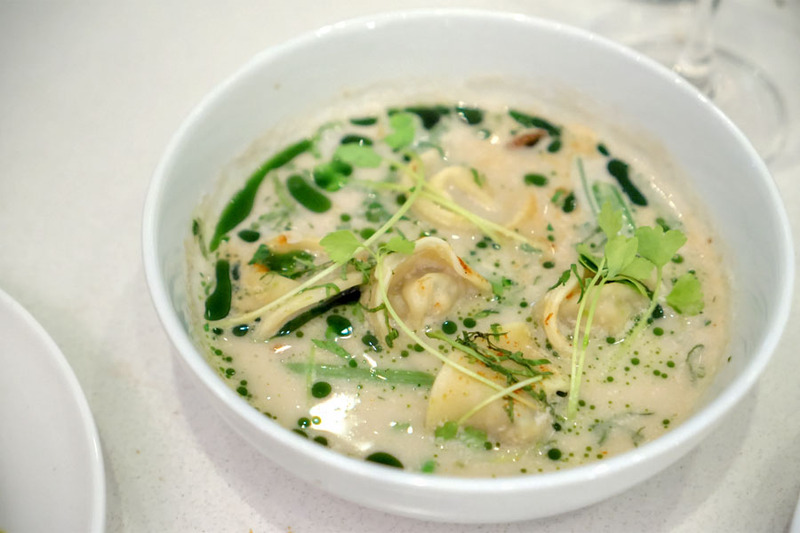 What prompted by return was a birthday dinner at 189, Dominique Ansel's first proper restaurant, which debuted with considerable fanfare at the start of November. About the Chef: Ansel was born in 1978 in Beauvais, a city in northern France about an hour or so outside of Paris, the youngest of four children. His father was a factory worker while his mother was a homemaker; the family often struggled with money, and thus the kids didn't eat well growing up. He attended school at Collège Charles Fauqueux from 1989 to 1994, and after finishing up his studies at age 16, he attended a local culinary school that offered free tuition. There, Ansel combined classroom learning with apprenticeships. He started out at local eatery Cour et Jardin on the savory side, then spent the last of year of the three year program at a nearby bakery, which is where he fell in love with the precision of pastry arts. At age 19, he began his mandatory military service, and as a part of that, spent a year in French Guiana teaching cooking. Upon returning to his hometown in 1998, he purchased a car for the equivalent of roughly $2000 and started driving to Paris daily, handing out résumés to as many bakeries as he could find. After just a few days, Ansel had eight job offers, and ended up at Peltier, one of the most longstanding pâtisseries in the City (now closed). He stayed there for a year before transitioning to Fauchon, a storied gourmet food purveyor founded in 1886 (it's where Pierre Hermé first made a name for himself). He was hired as part of a cadre of 30 seasonal workers for the holidays, and was the only worker of the group that was retained. Ansel began as a pastry cook, then was promoted to chef de partie six months later in 2000, while a further promotion to sous came in 2002. Two years later he was made Corporate Chef, a role that saw him lead the company's international expansion efforts. 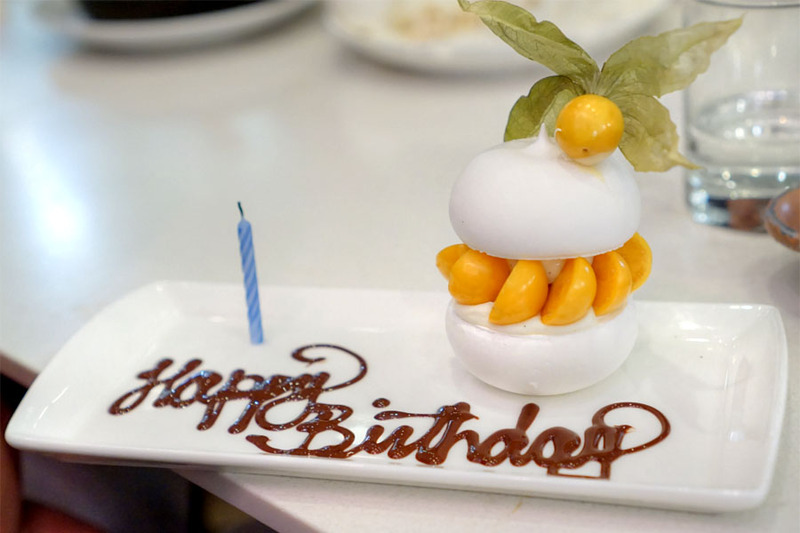 In 2006, Daniel Boulud called him about becoming the pastry chef at Daniel. 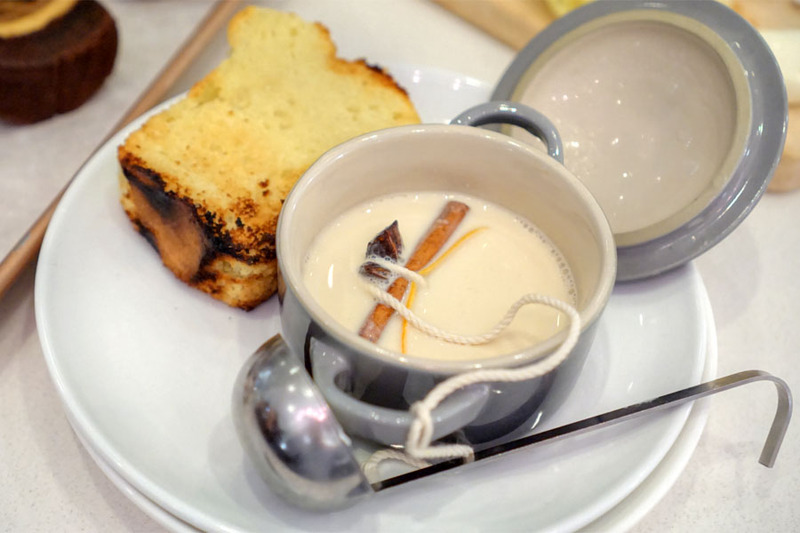 Ansel came Stateside to prepare a six dessert tasting for Boulud, and was hired on the spot (after the second dessert, in fact); he ended up moving to New York two months later. During his tenure at Daniel, the restaurant garnered three Michelin stars, a four-star review from the Times, and a James Beard award for "Outstanding Restaurant." 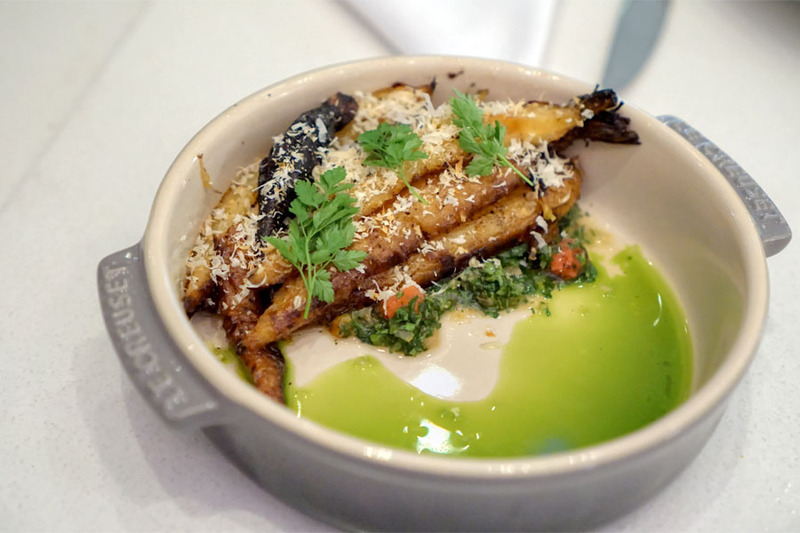 The Chef left in 2011, however, to open his first solo project: Dominique Ansel Bakery, which bowed in a small SoHo spot in November that year. The business was a success, and even won Ansel an "Outstanding Pastry Chef" nomination from Beard, but really blew up after Cronut mania took over in May 2013. 2014 saw the clinching of Beard's "Outstanding Pastry Chef" award, as well as the publishing of Dominique Ansel: The Secret Recipes by Simon & Schuster. With the accolades piling up, expansion was called for. 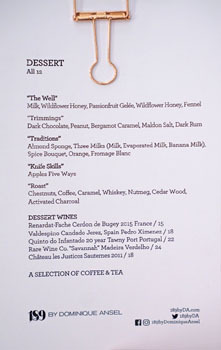 Dominique Ansel Kitchen in NYC's West Village (with its focus on more traditional, finished-to-order pastries) came in April 2015. Dominique Ansel Bakery Tokyo--in the Omotesando Hills shopping center--launched just two months later. September 2016 had the debut of Dominique Ansel Bakery London, while a second Japanese outpost (at the Mitsukoshi Ginza department store) arrived in March 2017. 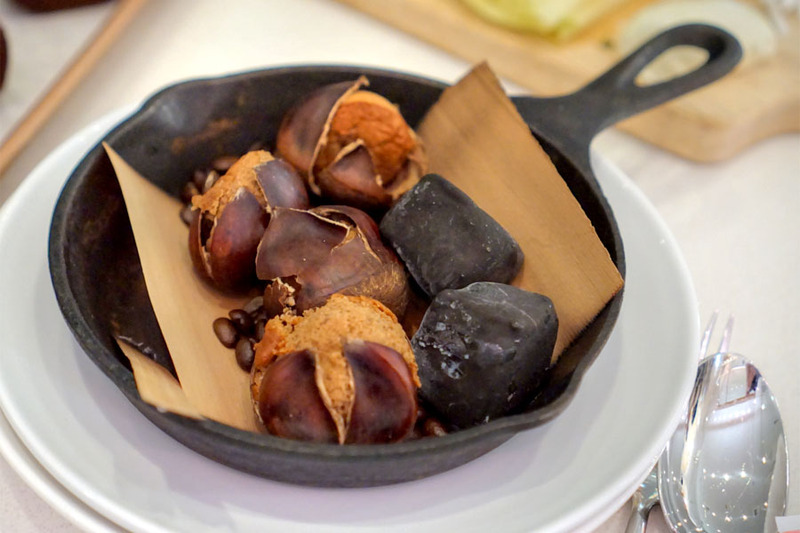 The Chef's next step was The Grove, a location he chose due to a successful Cronut pop-up he held here at Barneys back in March 2014. 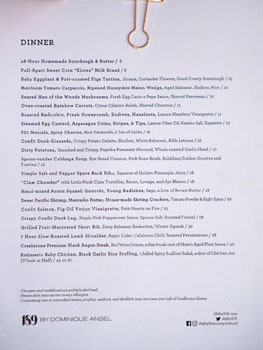 189, a name that references the address of the original DAB (189 Spring St) as well as the street number of The Grove, thus opened on November 4th for brunch, with dinner coming a week later. Dominique Ansel Bakery Los Angeles, meanwhile, dropped on November 10th. Running the day-to-day at 189 is Executive Chef Hyungon "Hyun" Lee, who was born in South Korea but raised in Buenos Aires. After finishing up his undergrad degree in Spanish Literature/Psychology at Emory in January 2006, he returned to Argentina to attend culinary school for a few months. Starting in February 2007, he worked as a sushi chef at a place called Imari, then began his education at the Culinary Institute of America at Greystone in January 2008. He worked at Terra in Saint Helena during this period, and after graduating in December 2010, staged at The French Laundry for a few weeks. Following, Lee went to work as a sous chef at The St. Regis San Francisco. He stayed there until November 2011, then came down to SoCal for a position at José Andrés' The Bazaar. In February 2015, he moved to New York to open Bar SixtyFive at Rainbow Room at the top of 30 Rock. Lee departed in January 2016 to become Culinary Manager for Culinary Concepts Hospitality Group, where he worked on menu and concept development. He remained at that post until June 2017, when he left to lead the kitchen at 189. The first floor is completely occupied by Dominique Ansel Bakery, so you'll need to head upstairs. 189 occupies the old home of Morel's French Steakhouse & Bistro, which closed in April 2017. The interior's been totally redone by Studio Unltd (Chianina, Moruno, Otium, The Rose, Petty Cash #2, BierBeisl Imbiss, Catch & Release, Bestia, Messhall, BierBeisl), and fortunately nary a trace of the staid former digs remain. There's room for up to 150 diners across the main dining area, bar, and outdoor terrace. A 12-seater private dining room, replete with its own patio, is also an option. 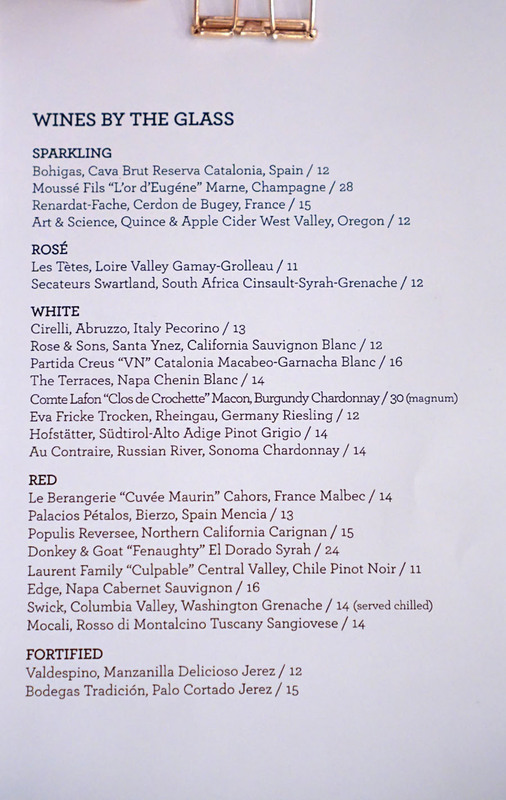 As far as 189's menu goes, think reworked versions of classics, with a Cal-French twist; it was actually more interesting than I'd anticipated. 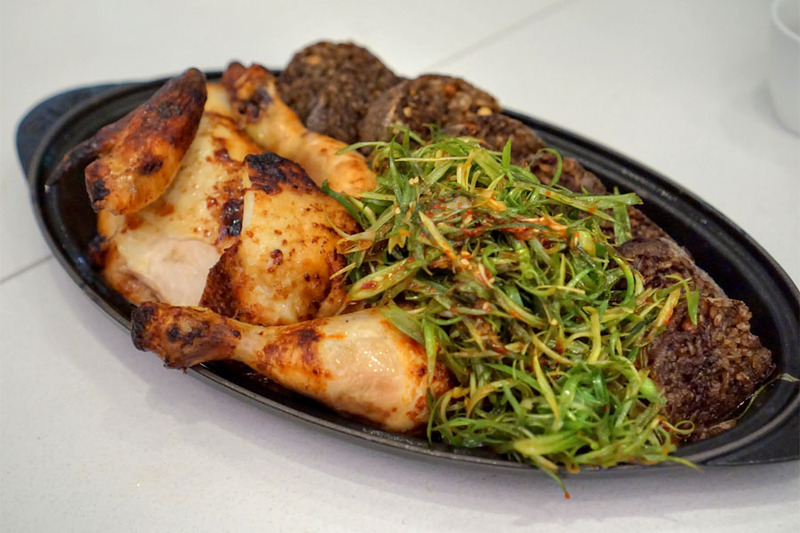 There's also a bar menu with small bites, and a family-style, dim sum-esque brunch is served on the weekends. 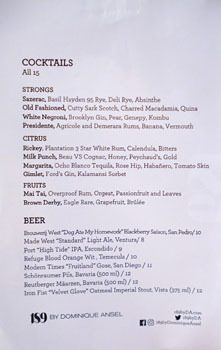 Drink-wise, you'll find ten cocktails, eight beers, and a relatively diverse wine list (there's also a separate bottle selection that's not pictured). Corkage is a hefty $35 a pop. Click for larger versions. 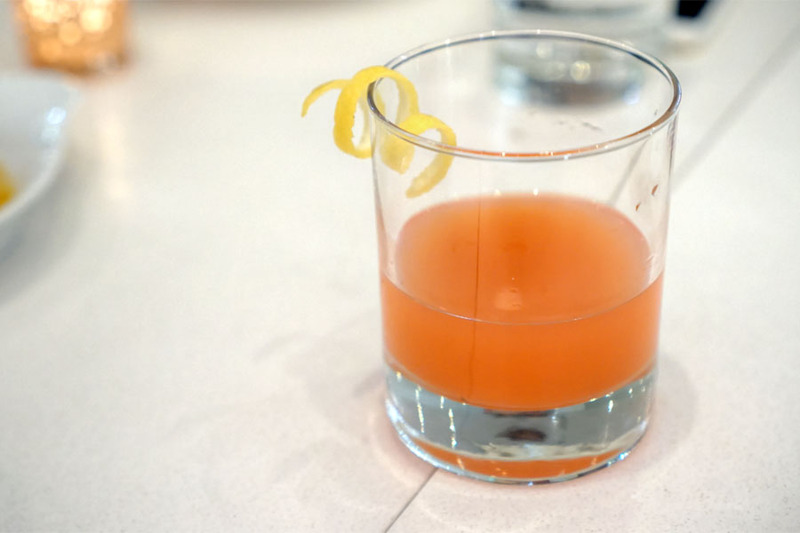 As usual, we went through a good number of cocktails, and got things going with 189's take on the iconic Sazerac. The nose was pleasant, though sweeter than anticipated, with a light candied quality creeping in. Taste-wise, there was plenty of rye spice and heat at first, but this was joined by a marked fruitiness and an almost suanmei-like sensation toward the close. 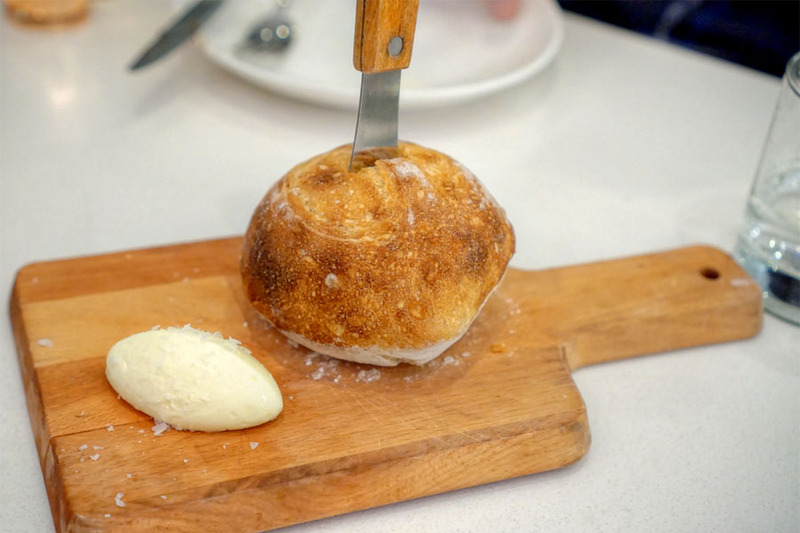 The sourdough didn't disappoint with its crustiness and persistent lactic tartness. And the butter? Soft, sweet, salty, superb. 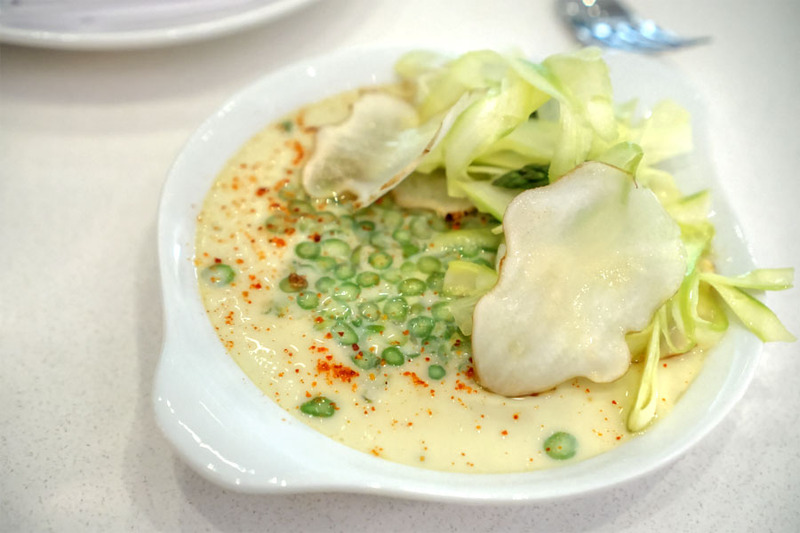 A warm egg custard conveyed a richness that stood up to the bitter crunch of asparagus. 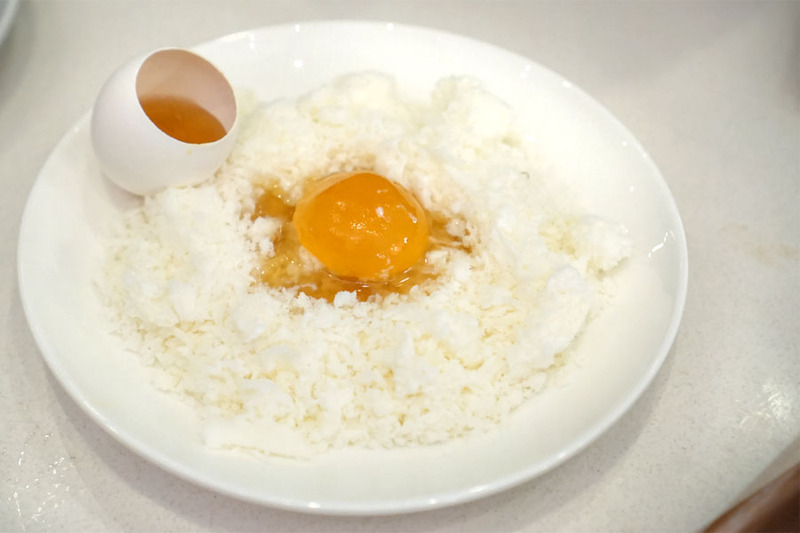 I wanted more acidity, more punch to the dish though. 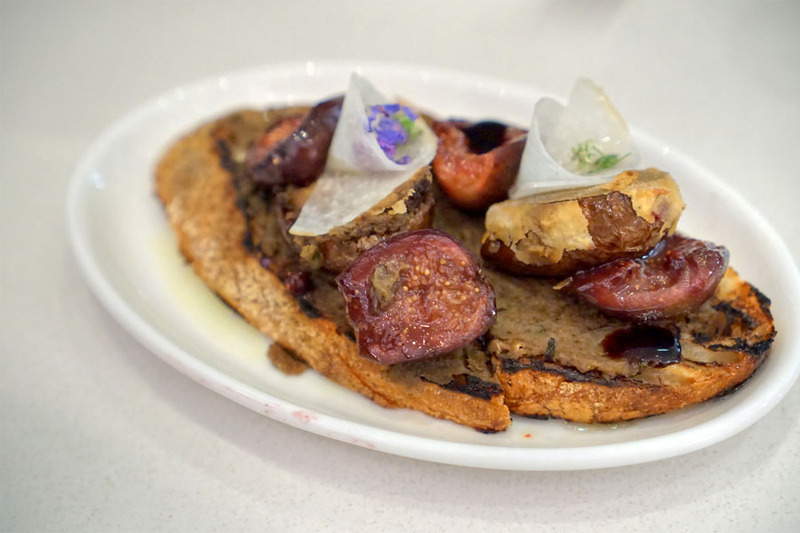 Our tartine showcased a definite sweet-tartness from the figs, tempered by the combined smokiness of the bread and eggplant, all while jicama imparted a lightness and crunch. 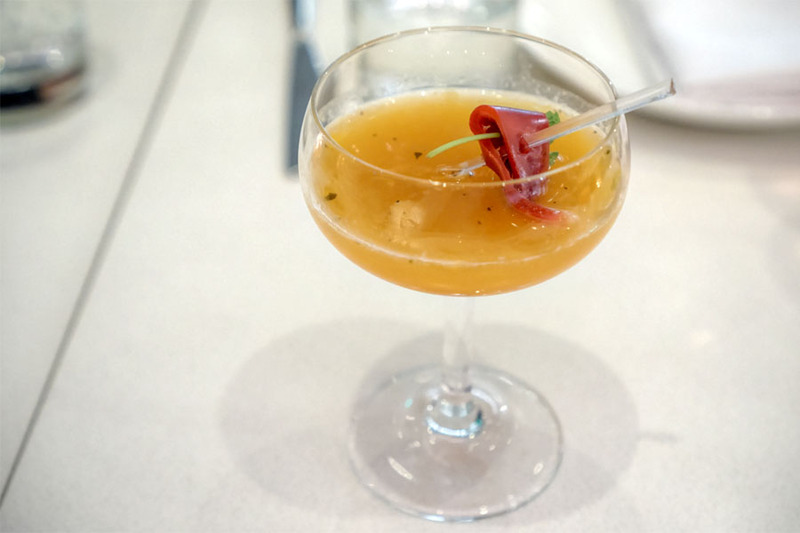 A reworked Mai Tai had a nose filled with tropical fruit and alcoholic heat. 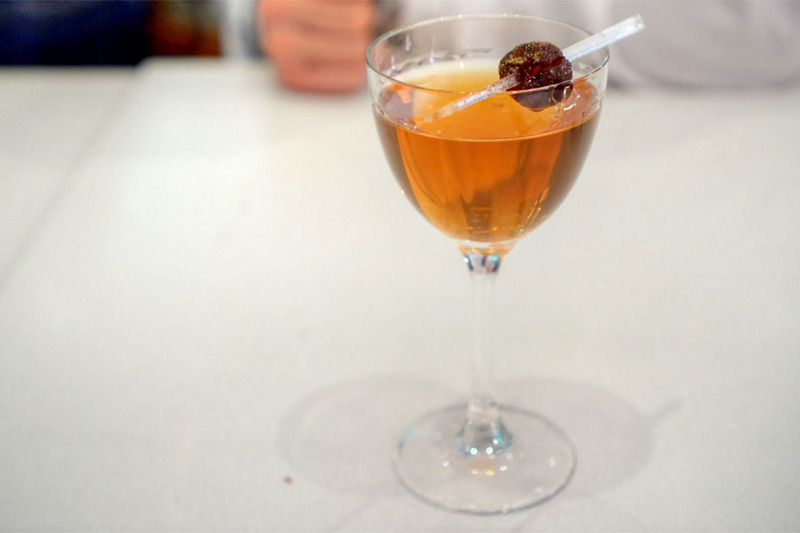 The palate followed, with its sugary, nutty nuances evened out by the booziness of the rum. 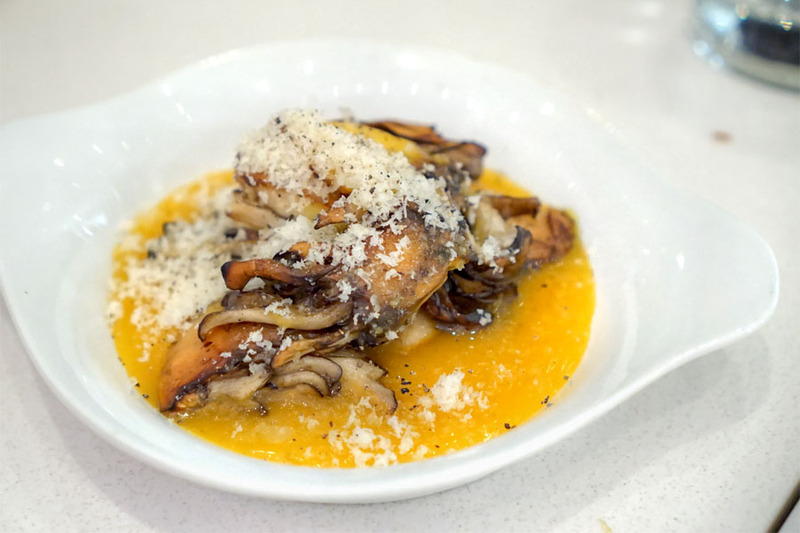 Mushrooms were smoky and savory, their woodsy character working in tandem with the eggy sauce on the bottom and a good dosing of pepper and Parm. 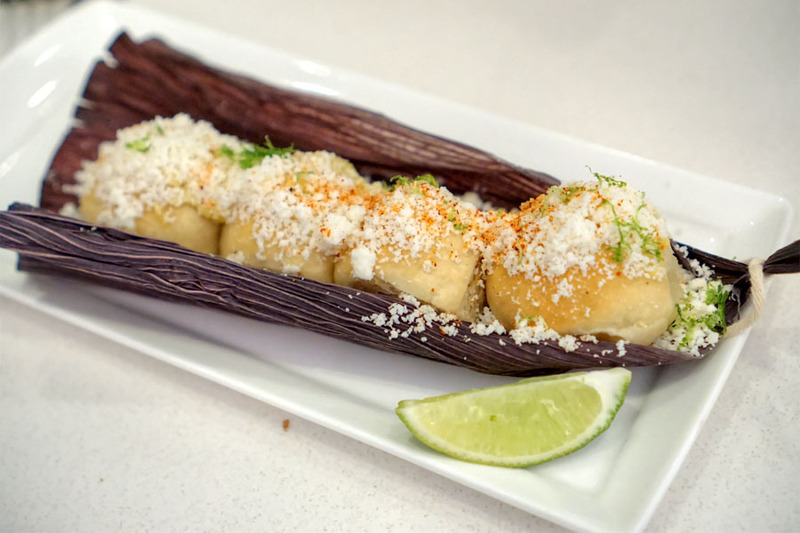 The milk bread was a fun one, really recalling the cheesy, sour, and spicy elements that you get in a classic elote. A non-traditional clam chowder worked. The brine of the little necks was well displayed, complemented by the smokiness of bacon and the brightness from all that greenery. 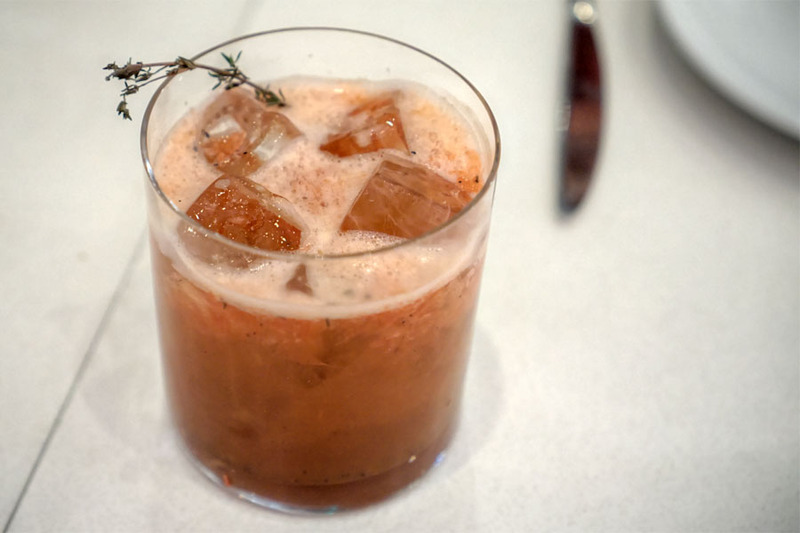 An updated Old Fashioned cocktail displayed a nose of aromatic sweet spice, light citrus, and dark fruit. The taste went in a boozy, spicy, slightly bitter direction at first, with sweet, soft, fruity notes coming in later. 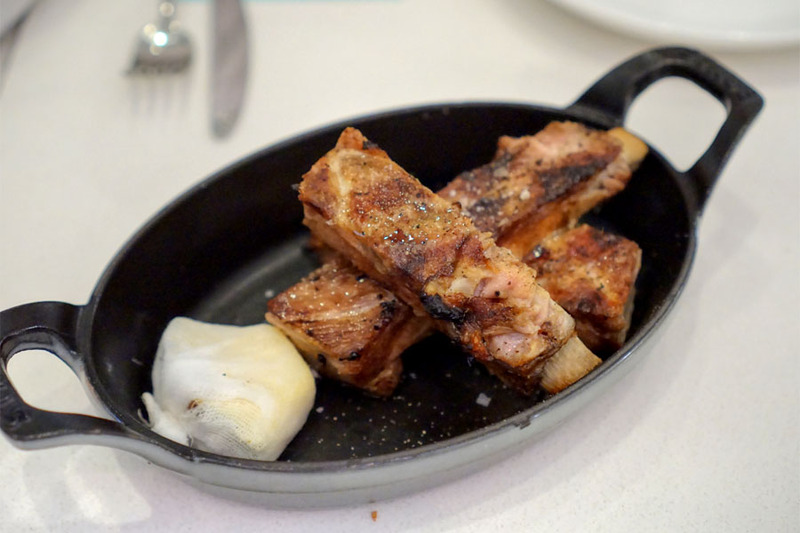 The ribs were a favorite of mine, and were some of the best I've had in recent times. I found 'em super tender, yet still substantial, with a delightfully smoky flavor profile perked up by a squirt of the included pineapple. A bit Chinese-y, actually. Gizzards conveyed a satisfying bite, while flavors were rich and earthy--a great pairing with those crispy hash browns. 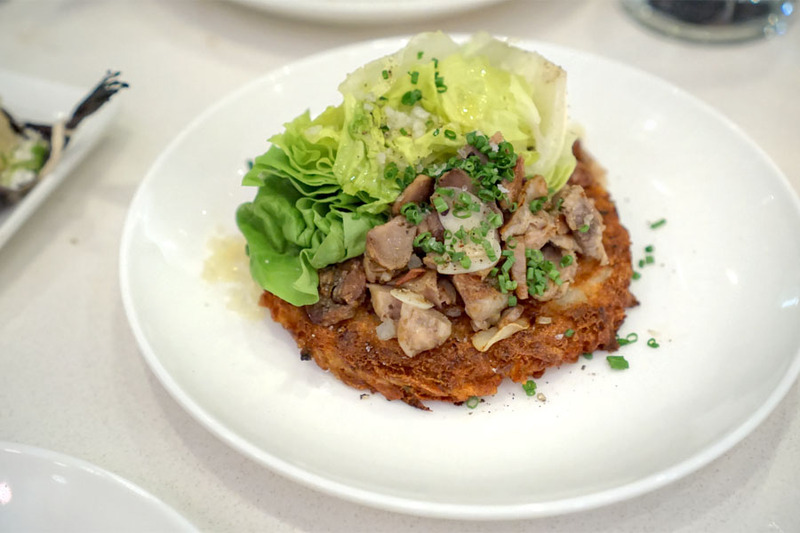 The lettuce, meanwhile, was crucial, providing a lightness and brightness that really completed the dish. Another standout. Carrots arrived soft and sticky, and absolutely teeming with sweet, autumnal spice. The char astringency present worked as a counterpoint, as did the zestiness of that cilantro relish. 189's version of milk punch smelled milky and sweet--nice. Flavors, meanwhile, were more astringent at first blush, with the floral, bittersweet combination of Peychaud's and honey coming in later. I was a fan of the potatoes, a particularly hefty, hearty preparation offset by the application of mustard and plenty of garlic. Short ribs came out tender and juicy, with aggressive flavors that definitely veered savory, salty, and smoky--very tasty. The squash, though, didn't quite fit in for me, and I would've liked some more acid in there. 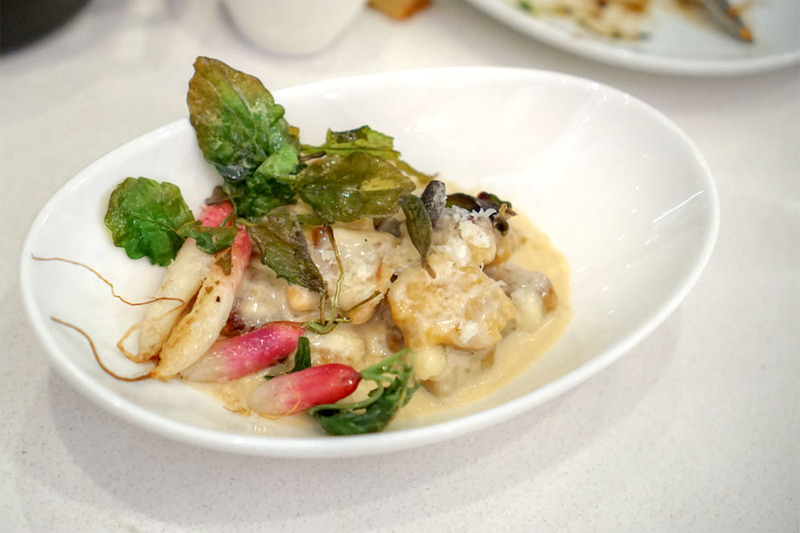 Gnocchi were supple and creamy, with a restrained sweetness and nuttiness from the brown butter. Sage provided some nice aromatics, and I appreciated the bitter crunch from the radishes, too. 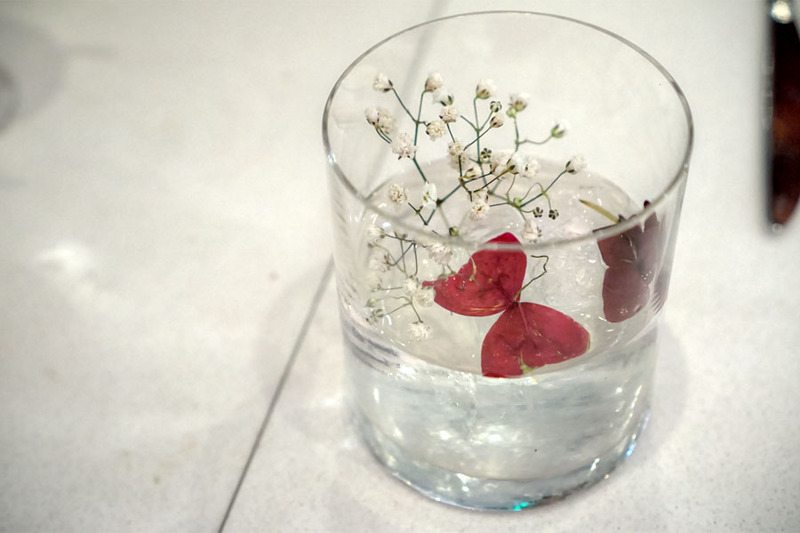 Our next cocktail was a fancifully garnished Negroni variation. This one smelled decidedly herby and botanical, with some heat from the gin and a smidge of pear. The taste went in the same herbal direction, but also showed off a distinct fruitiness that made for some balance. Our final savory was a fairly classic rendition of roasted chicken. I found the bird properly moist, even on the white meat, while the skin was as flavorful as expected. What was more interesting were the Korean-esque accompaniments here. The savory, well-textured rice stuffing recalled soondae, while the spicy scallions were pretty much pa muchim. Or maybe this was just supposed to be jeongigui tongdak? Given where we were, we felt compelled to order all the desserts, which are definitely on the whimsical side. Click for a larger version. 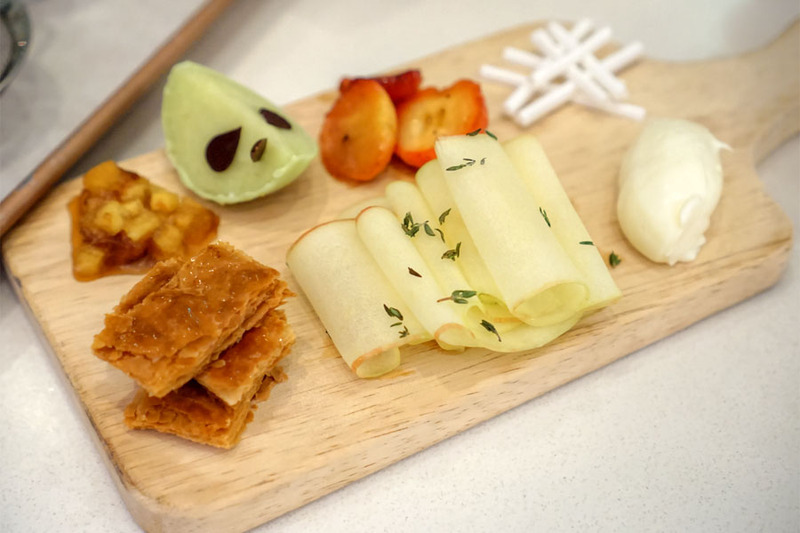 With its flaky puff pastry, sweet-n-sour-n-spicy crab apple, sugary caramelized apple, and bright, bracing apple sorbet, our first dessert was either a reimagined fruit plate or a deconstructed apple pie. 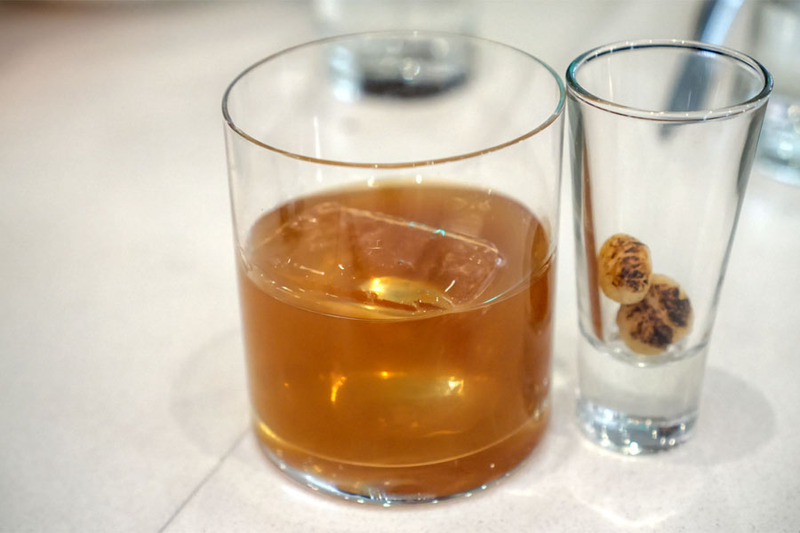 As far as cocktails go, this next one was a standout. Its bouquet was appealing, with a sweet heat from the rums layered with dark fruit. On the palate, I found it boozy and a touch tart, with lots more dark fruit commingled with light banana and sweet spice. Here we had a spot on marriage of milk, honey, and sugary fruit, along with some great, meringue-like textures. 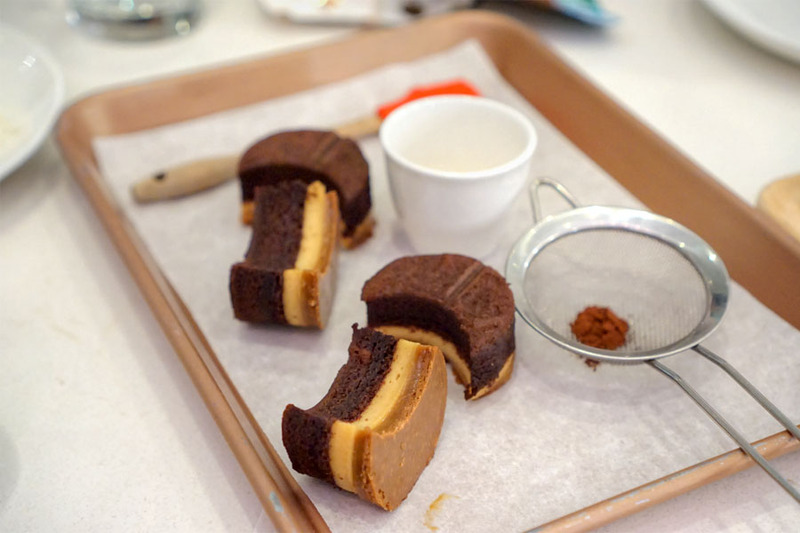 Crescent-shaped cakes displayed a cozy combination of chocolate and peanut flavors, joined by rich caramel and a touch of fruity rum. An almond sponge bread was superb when soaked in the included cup of fruity, spiced-infused tres leches. 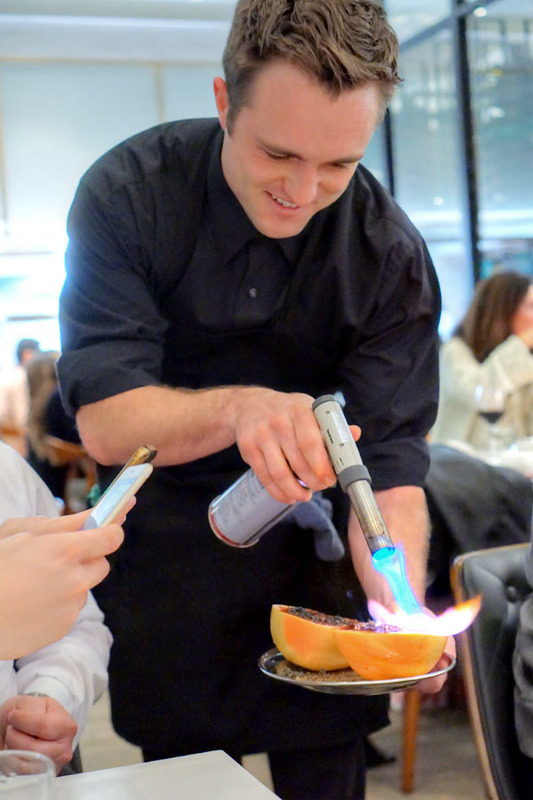 Our final cocktail was another favorite of mine, and even came with a tableside torching of grapefruit. Its nose was honeyed and spicy, with a wisp of smoke. In terms of taste, I got rich grapefruit combined with soft spice and an unexpected hit of umami toward the close. 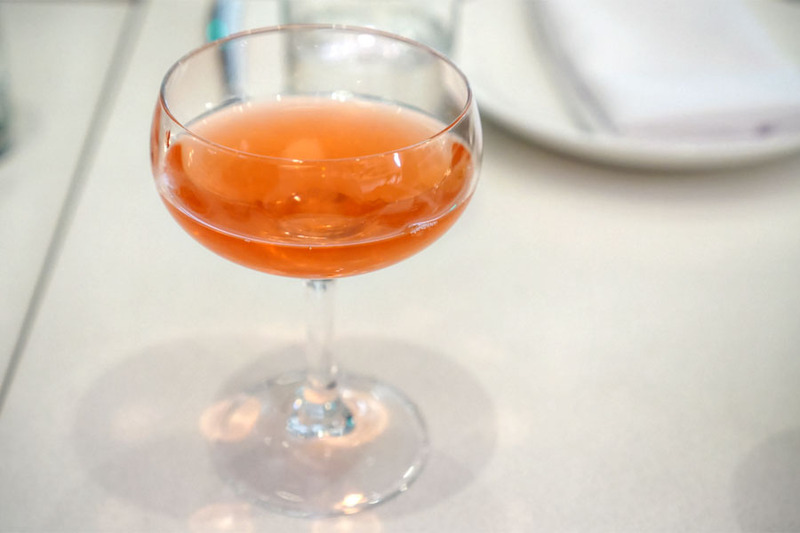 In addition, there was an interesting textural component from all the grapefruit vesicles left in the drink. 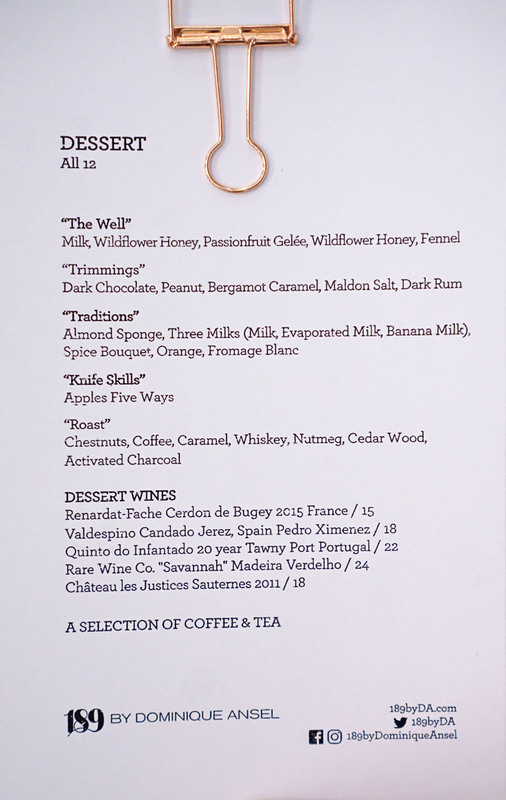 This next dessert was apropos for the season with its commingling of chestnut, caramel, and nutmeg. I especially appreciated the roasty crunch of the coffee beans here, but my favorite element were the charcoal-coated blocks of ice cream. Given that this was a birthday dinner, we were provided a complimentary pavlova from the bakery downstairs. Think creamy and lactic, with a bit of a funk, all set against the sourness of the fruit. 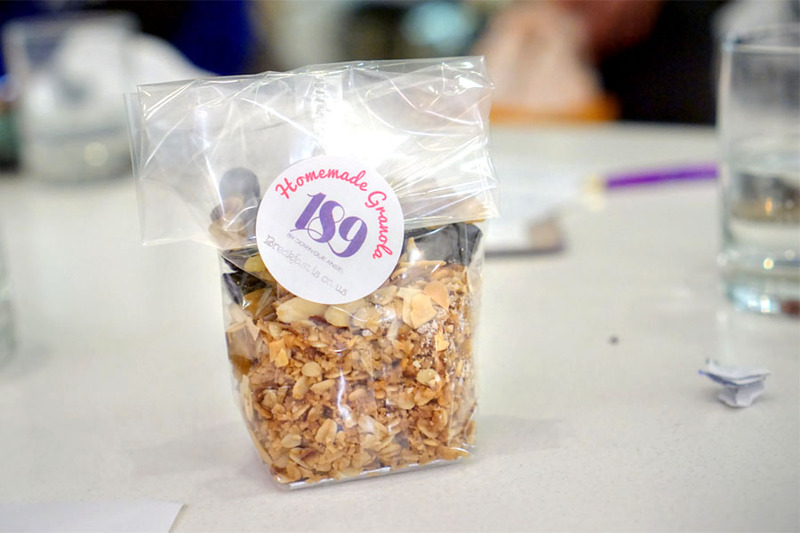 To take home: the Bakery's Homemade Granola with hazelnuts, almonds, dried cherries, and golden raisins. 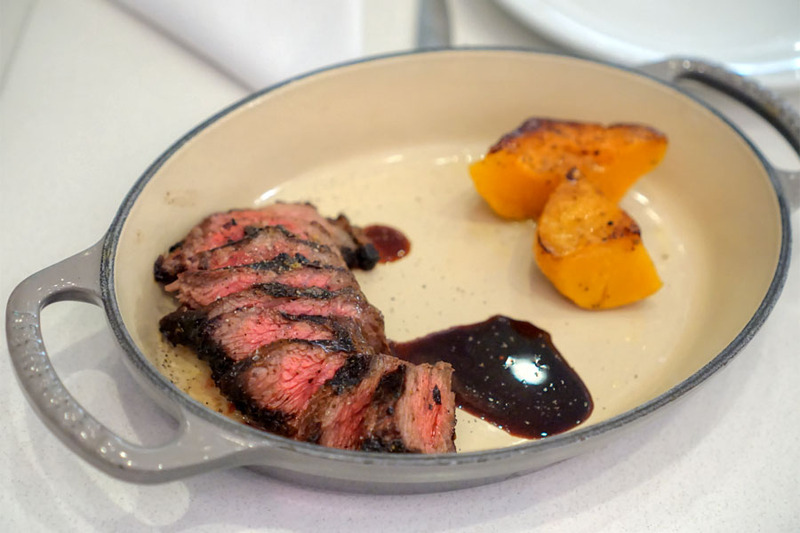 Despite my trepidations about the restaurant, we ended up having a pretty solid meal at 189. 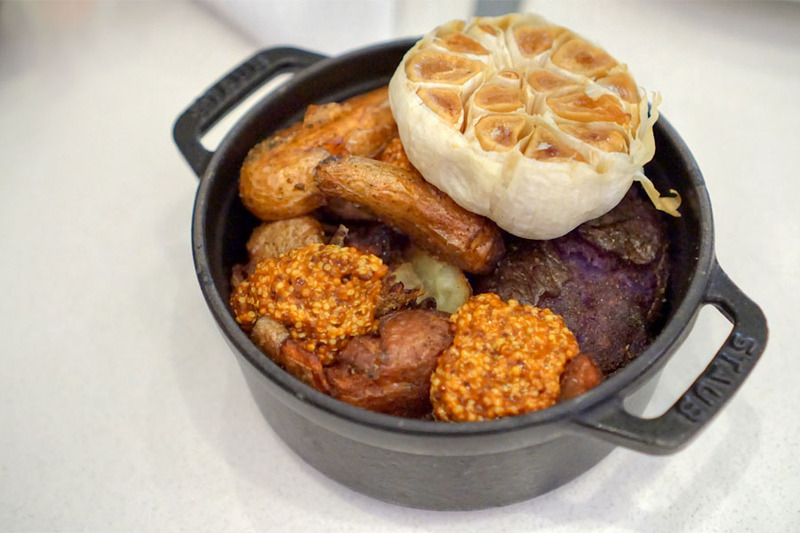 The food's rooted in French cookery, but incorporates a number of outside-the-box twists that Ansel's known for. 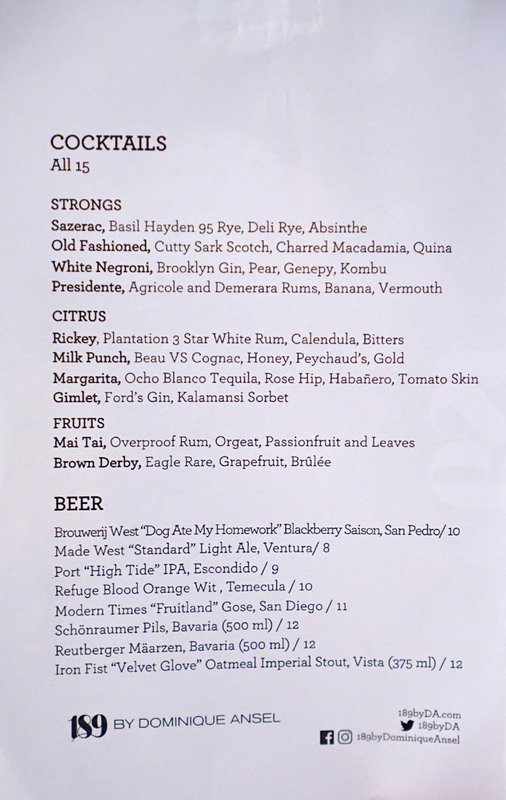 I also got a glimpse of the kitchen's more multicultural, Californian influences, which I'd like to see more of. 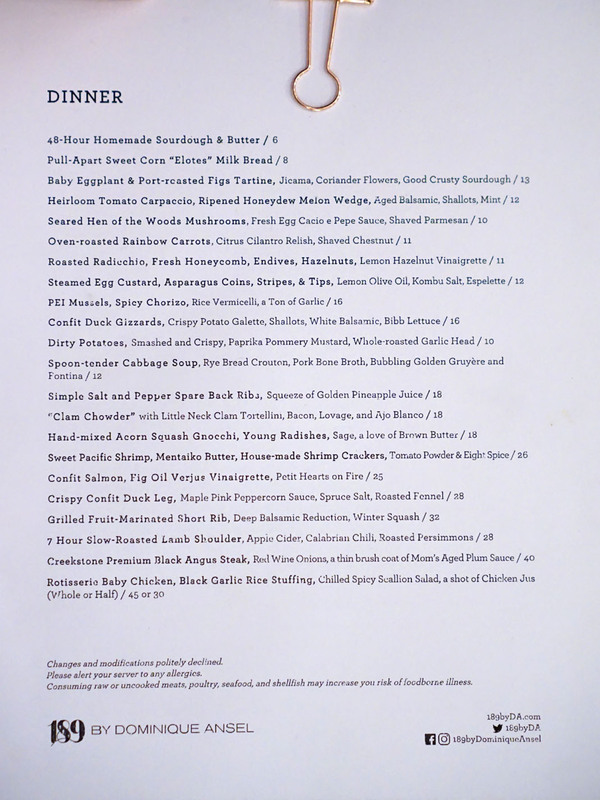 The menu could use some finessing here and there, but I think there's promise, especially given that the place just opened. A good addition to The Grove. 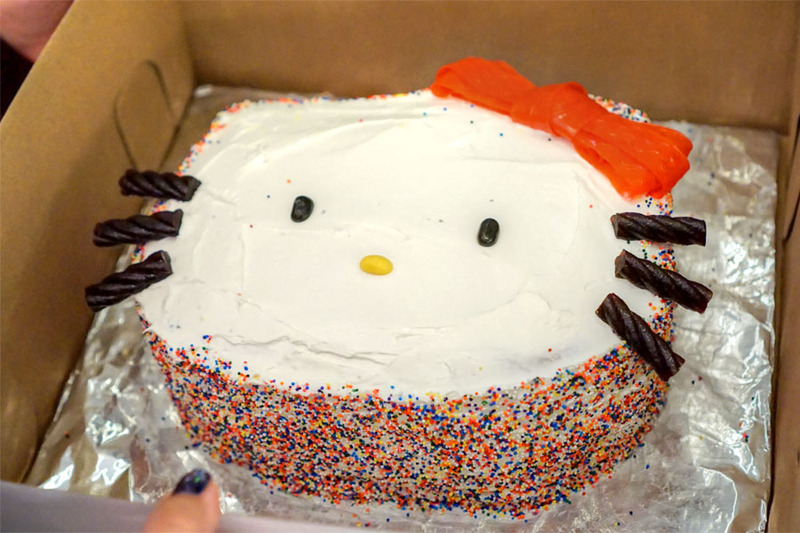 As this was a birthday, one of my dining companions baked a Hello Kitty cake. Unfortunately we weren't allowed to consume it in the restaurant, so we ended up eating it outside. It was a dense, vanilla-scented yellow cake with chocolate frosting, one that definitely had me feeling all nostalgic. On a related note, Ansel really needs to do a limited edition Hello Kitty Cronut. 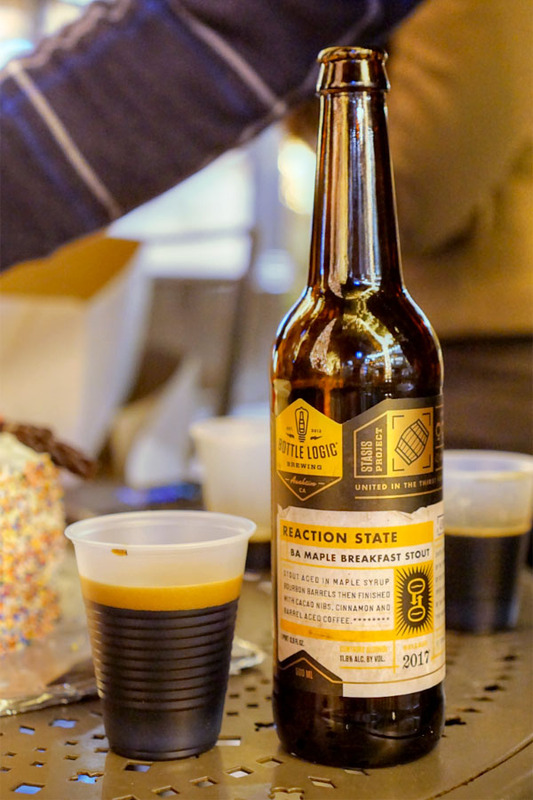 To go with the cake, we opened up a bottle of the 2017 Bottle Logic Reaction State, a breakfast stout aged in maple syrup-enriched bourbon barrels, then finished with cacao nibs, cinnamon, Tahitian vanilla, and barrel-aged Coldbot coffee. Its nose was sweet and roasty, with traces of cinnamon, while the taste displayed sweet cinnamon-y spice alongside roasty coffee, chocolate, and an undercurrent of rich maple. Actually a very fitting pairing to Hello Kitty.